After getting through a tough Sanchez squad in the morning game followed by a three-set thriller against ND, the St. John’s Knights were locked in for a battle between the Academy Cougars for the 2017 Shieh Preseason Volleyball Title. The weekend-long tournament was set to conclude Sunday afternoon at the GW gym. Wendy’s Player of the Game Hallie Wigsten. The Knights would capture momentum in the 1st set and just rode that same wave in the 2nd set to end the Cougars perfect tourney run 25-20, 25-17. Wendy’s Player of the Game Hallie Wigsten is just a sophomore on a team made up primarily of underclassmen. 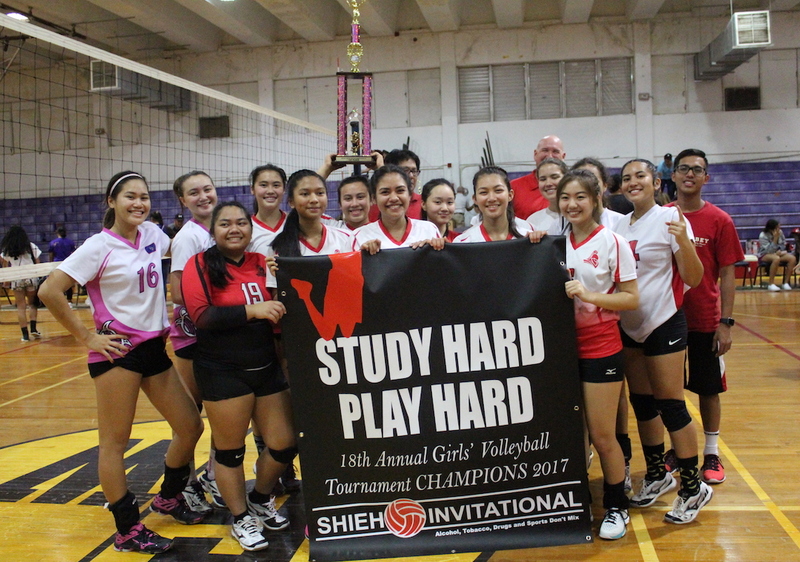 Winning the Shieh tourney was a big morale boost for her young team with the IIAAG season officially ready to begin this week. “This was a great experience for the whole team, especially since we’re so young and we have other players who’ve come from other schools. Our chemistry has gotten so much better over the past few weeks. We’re excited to get the season going because we know it’s going to be very competitive,” added Wigsten. St. John’s dominated the game from the service line with aces and serving errors doing the Cougars in. Wigsten totalled four aces all game with the Knights catching fire in the closeout set. An ace from Wigsten followed by an ace from teammate Hana Fernandez two plays later had the Knights in the drivers seat 13-7 in the second set. Freshman Tylee Shepherd added to the strong serves with an ace of her own to extend 17-10, forcing the Cougars into their second timeout of the set. The Knights then went on a hitting spree with Wigsten, Fernandez and Shepherd each registering a kill as part of a 4-0 run to get up 24-15. Cougar Lauren Hoebing would score her fourth kill of the game to momentarily stop the bleeding, but a Cougar service error ended their tourney run. “Academy is such a great team and I know a lot of the players there. But we were just really focused and confident from the beginning after how we got to the championship game, like beating ND, and we just used the confidence to perform well on both ends,” said Hallie. The GW Geckos defeated the ND Royals in three sets to take 3rd place in the tourney.